A couple of weeks ago I embarked on a mission to make my own tortilla chips. Ok, it wasnt that much of an adventure, but I wanted to test out making homemade chips before I attempted it at a party. Like most things homemade – these tortilla chips are 100 times better than the store bought ones. They are more dense and sturdy for dipping. While it takes more effort to heat the oil (and more work discarding the oil afterward), you can make smaller batches of chips. And, it is very economical too. I used corn tortillas, cut them into wedges and fried them until golden brown in canola oil. Salt them as they are coming out. 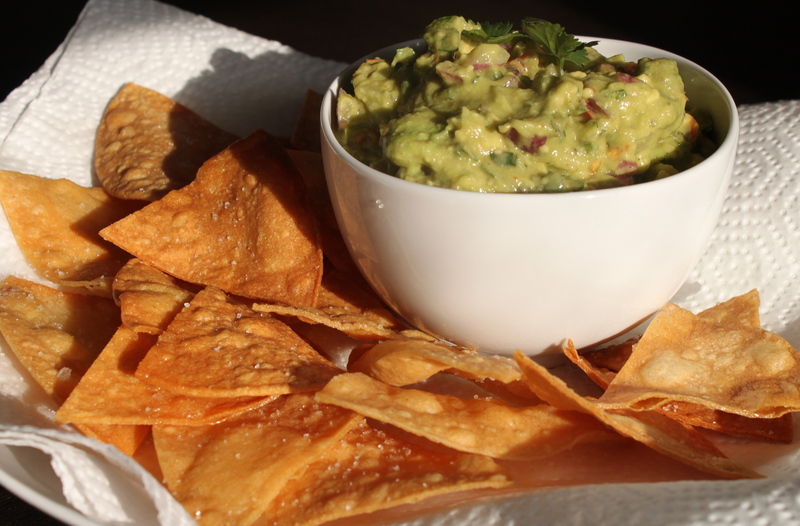 Serve with your favorite salsa or homemade guacamole. I served these along with shrimp tacos – a delicious evening of culinary experimentation! At what temperature did you heat the oil? Because of some friends who don’t like fried chips, I do both flour and corn tortillas in the oven and make chips that way, and they turn out great. Maybe a little spritz of olive oil over them, with some garlic & onion powder — does the trick! I’d for your fried chips, though! Look delicious!